Eid Mubarak to all my friends, followers, and family! Here we are enjoying a glorious Eid Al Adha 2015. 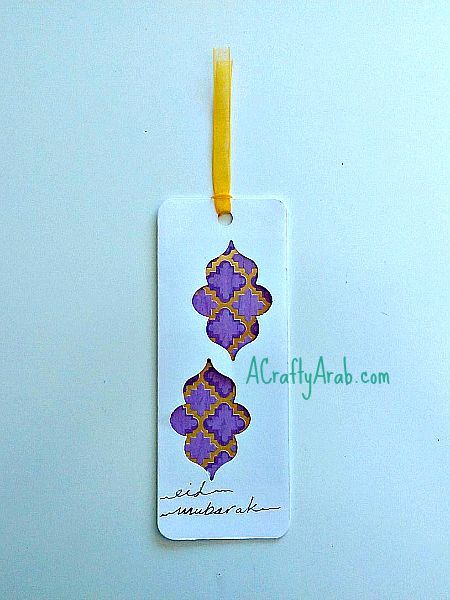 Eid Mubarak means Blessed Festival in Arabic and is said to Muslims as they celebrate major religious holidays. Eid Al Adha is an event commemorating the willingness of Prophet Abraham to sacrifice his promised son, Ismail, as an act of submission to God’s command, before God intervened to provide Prophet Abraham with a lamb to sacrifice instead. This day is being observed by 1.75 billion people around the world. Last year we went to a party with a few friends and are looking forward to spending time again with them soon. This time of year is very special to Muslims who are able to perform Hajj, one of the 5 pillars of Islam. Hajj is the Arabic word for pilgrimage and entails visiting the sacred city of Mecca, Saudi Arabia, to perform specific religious rituals. For those unable to perform Hajj, they may fast and observe Eid to take part in the consecrations of the season. This year I’m honored to be taking part of Multicultural Kid’s Blog series on Hajj for Kids. 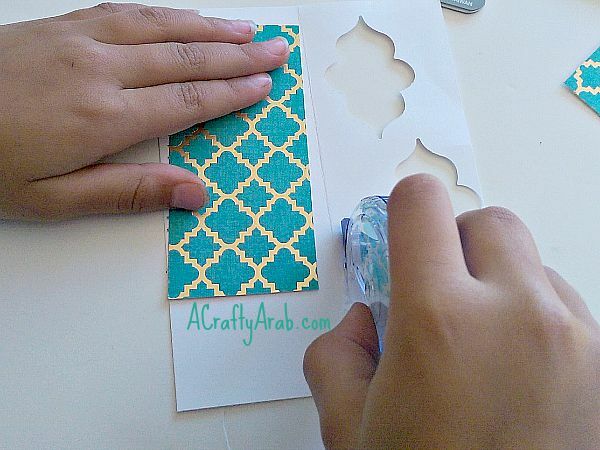 As my post falls on a holiday, I thought I’d celebrate by creating an Eid craft with my daughter to share with everyone. 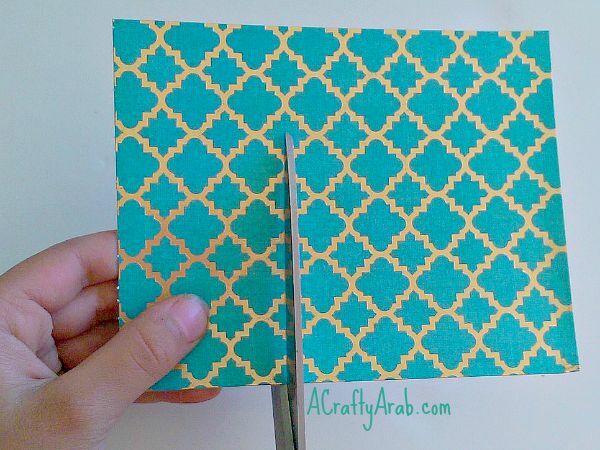 Start by folding your 8 x 11 white cardstock in half and cutting on the fold. Turn the long pieces sideways and cut it in half again. You should be left with 4 pieces that are 4 x 5 1/2 each. 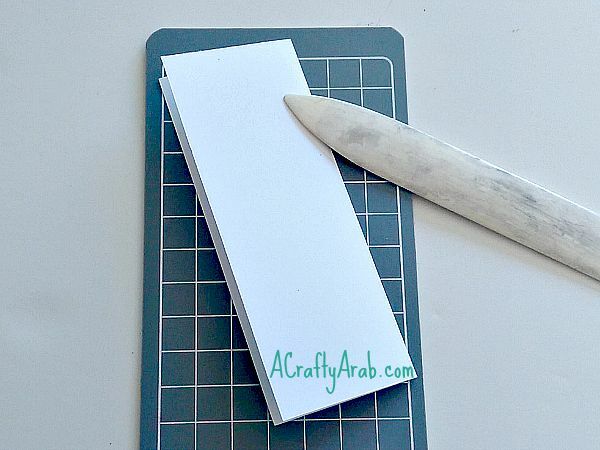 Fold your paper in half and use the bonefolder or a ruler to make sure it is creased well. I bought this lattice design Fisher punch system and find it’s really great for punches that can be placed anywhere. 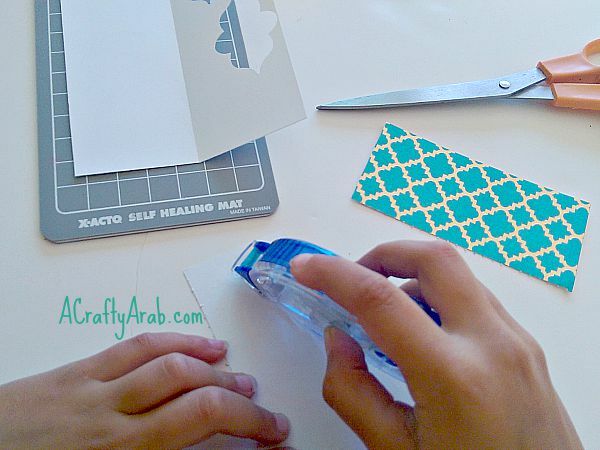 You can also use a regular punch or even a hole punch to make a punched out design on the left side of the fold. 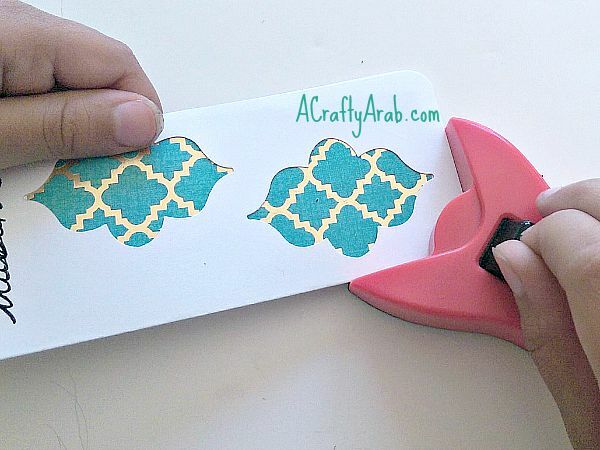 Move your punch elsewhere on the paper and punch out the same design again. 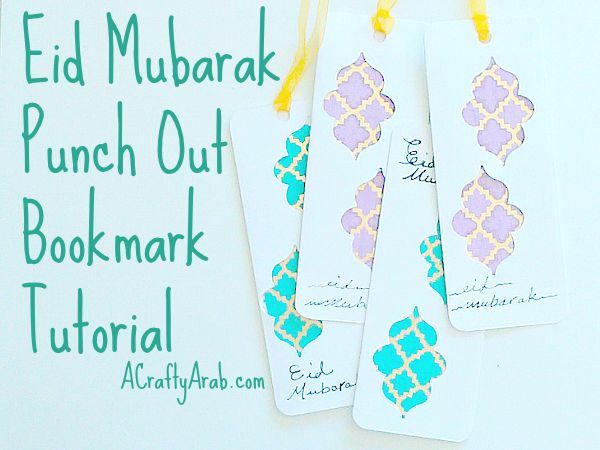 Use the scissors to cut out a small piece of decorative paper that will fit inside the folded bookmark. 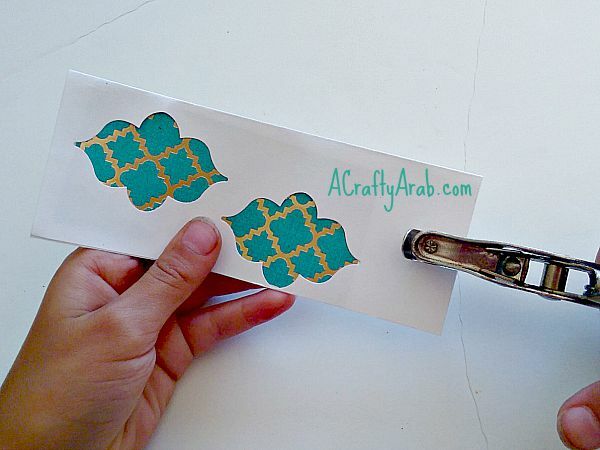 Add double sided tape to the back of your decorative paper and place it on the un-punched side of the white cardstock. 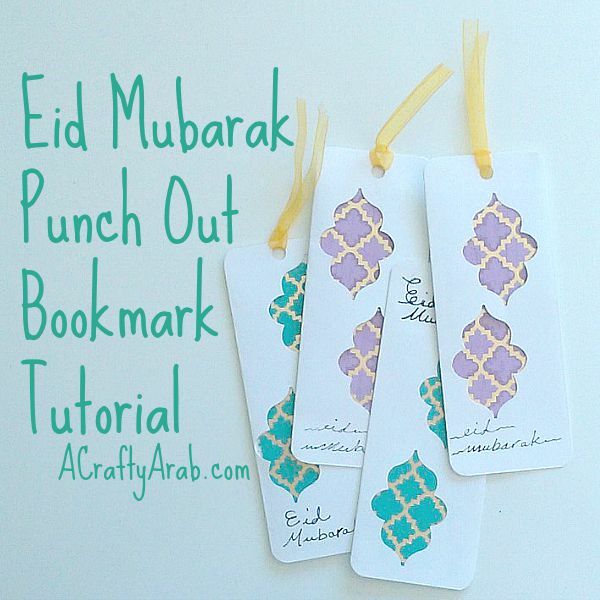 Add double sided tape to the sides of the lattice punch outs to secure the bookmark closed. Close over your lattice side and punch a hole at one end. 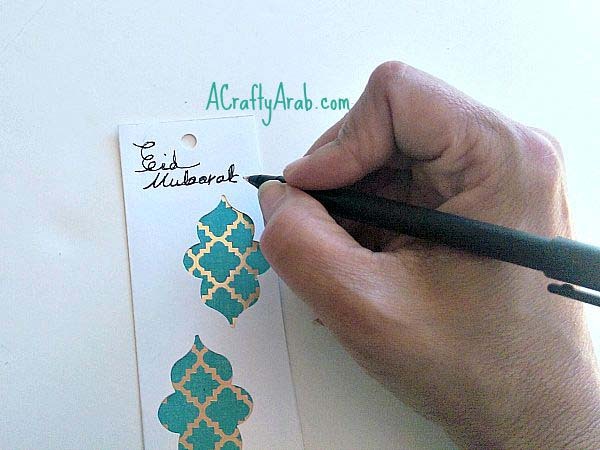 Use your pen to write Eid Mubarak. 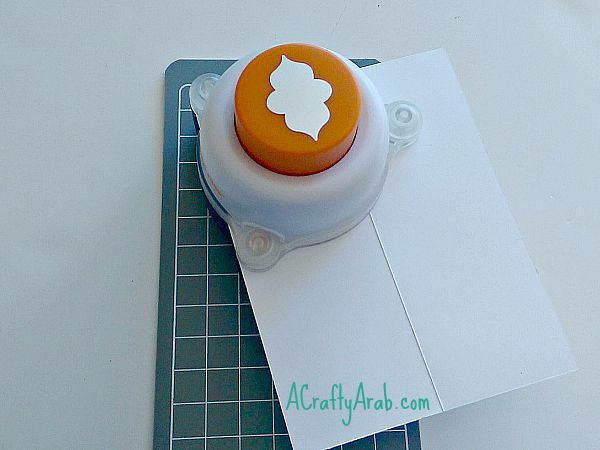 Make the corners nice with a rounded out punch. Cut a ribbon piece that is about 6 inches long and fold it in half. 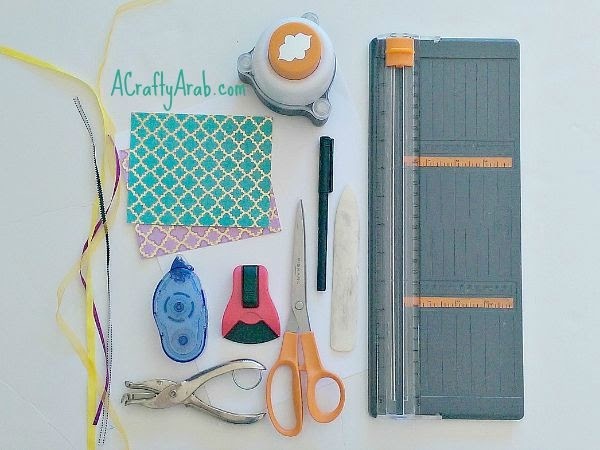 Place the folded end of the ribbon through the hole punch and bring the loose ends through the loop. Pull snug and your bookmark is done. 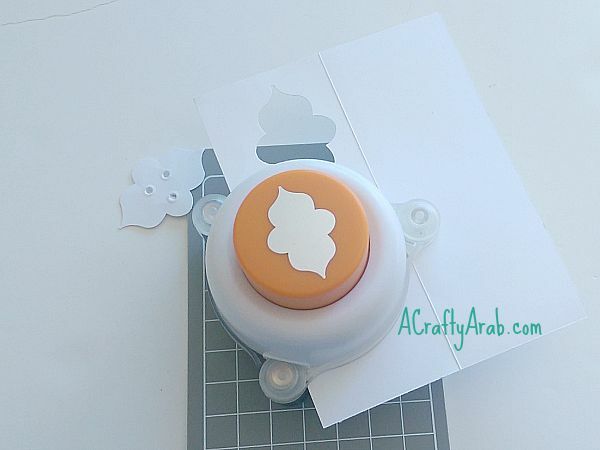 We also made more using a different decorative paper inside. My daughter will take these to school to pass out to her teachers today. Enjoy making your own!